Our experience with Pioneer Millworks went from bad to unworkable. While we were looking for a reclaimed wood source, they provided our contractor, Schuchart/Dow, with a sample of their reclaimed wood that everyone liked. The interior designers, NB Design Group, especially liked it for its regularity across all the pieces of wood, i.e., it wasn’t just a hodge-podge of wood thrown together. Little did they know the sample had no relation to reality. Our contractor and interior designers know what they’re doing. Schuchart/Dow is a respected contractor who does high-end homes and has won awards for their work. NB Design Group is a respected interior design firm who also does high-end homes and has won awards — in fact, they are who a certain extremely wealthy Seattleite uses for interior design. These are two companies with experience and knowledge about quality. We originally planned to use the wood for wall cabinetry and for two doors. We decided to not use the wood for the doors, so we cancelled that part of the order. That was the beginning of problems with Pioneer Millworks, as their salesman threatened us with a stiff fee to cancel the order (that hadn’t even shipped yet). That seemed to get resolved okay, but I’ve lived long enough to know that when a company starts off like that, making threats, no less, it only gets worse. This is no exception. We agree and think it doesn’t look good. The photos look much more random in texture and color compared to the sample. If it were just me and Gay, two inexperienced people, we’d assume that we just don’t know enough to know that’s how reclaimed wood comes. But Schuchart/Dow and NB Design Group have decades of experience. They didn’t like it at all. Anyone can see that several of the pieces look like they were taken from a Home Depot and thrown in the mix. Only half of them have the rustic saw-cuts in them. Yet 4 of the 5 pieces in the sample have them. Martin Brett couldn’t see that. He thinks it’s just a question of color. Thanks for the photos, those worked well. The sample you have looks like it has a finish on it, I can’t be sure but we usually send them with either an oil or water based polyurethane. It’s a little light for oil so I’m guessing it’s a poly. The photos of the material you’ve received look like our typical mix of hardwood, we can see ash, elm, and oak in there. I would suggest that you take a small part of the batch, give it a light wire brush (hand held) and then a light sanding. Once you’ve blown the dust off put a coat of oil/poly on there and see if that meets you’re desired aesthetics. Good luck. I talked to Pioneer Millworks about it and they say if it’s stained, it’ll look just like the sample. Do you think it can be salvaged? We feel like we’re under the gun to find something else or just make the best of this wood. I disagree, there is way too much variation in the material, this is too important to compromise on. If you look at those photos of 10 pieces, it’s easy to pick out 3 that clearly don’t match the sample and there are 1 or 2 more that are too difficult to determine. So, at least 3 and as high as 5 (30%-50%) of the 10 pieces in the photo are not representative of the sample. We ordered 30% more than we need, which seems like plenty, but that’s not nearly enough to account for the bad pieces. Your web site photos are too small to really determine if our wood is similar to your web site’s photos, but we were told that the wood would look like the sample and we believed your salesman. I find it hard to believe that it’s typical for 30-50% of the wood you ship to not look at all like your sample. It sounds to me like you’re telling me that it is normal and you won’t try to provide wood that is representative of your sample. Is that the case? I think you’re going to need to discuss this with Schuchart Dow as they specified the material and we subsequently produced your material from that specification. Reclaimed wood is not as homogenous as ‘new’ material therefore samples are provided to give you an idea as to you will find within the material we ship, however they are not ‘limit samples’ showing the extremes of the grade. 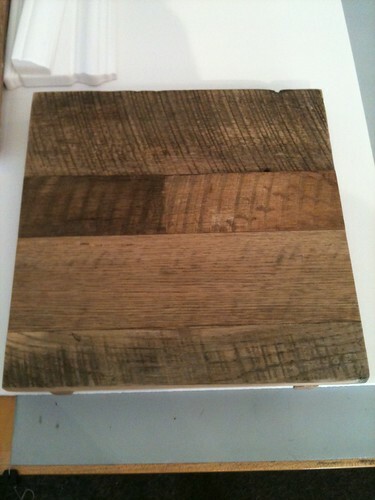 In a 12″ x 12″ sample we could not begin to show the variation that we see in our Settlers Plank grade. We are very clear when we ship samples and we inform potential clients of this with each sample. The two grades we have in our hardwoods are American Gothic (fully planed, no patina) and Settlers Plank (variety of patina and sawn boards). 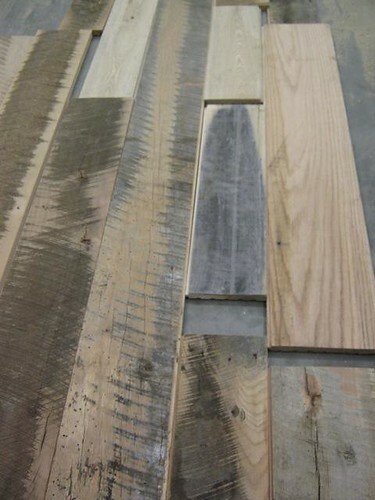 All of our Settlers Plank is produced in New York and shipped to our standard grade. One option would be to order additional material and then further ‘cull’ the boards that you feel work for your project. However before you do that I would like to come back to something you mentioned earlier today. You indicated that you’re using the material for doors/cabinets, as a result I’d expect that you’re going to give the product a light to moderate sanding prior to install. As you sand the material the patina will disappear quite quickly as the aged layer on the outside of old wood is surprisingly thin. Therefore if you’re looking for a lighter patina level throughout I’d suggest you give the material a heavier sand in order to get the desired mix. Alternatively you could run the material through a onsite planer and get the same effect. Hopefully one of those options will work for you. He’s trying to push this off and blame Schuchart/Dow for not understanding that the sample and the wood they provided do match and then suggests two options to fix the problem (that he says doesn’t exist): 1) keep ordering more random wood from them and hope we can get enough to use or 2) sand the reclaimed wood appearance off even more to get rid of that “aged layer on the outside”. We bought reclaimed wood specifically to get wood that looks aged, why would we want to get rid of the “aged layer”?!? He even said their samples “could not begin to show the variation” in the wood. Then why provide samples at all? Or why provide samples so small that even he thinks they’re too small? He claims that what we got is very typical of what they ship, so he must know what is typical, so why don’t they make samples that show what they typically deliver? The truth is that we looked at lots of samples of wood and chose this specifically because their salesman said the uniformity of the sample is what we’ll get in our order. Pioneer Millworks simply lied to Schuchart/Dow and to NB Design Group about their sample to get a sale, knowing they wouldn’t stand behind it once the wood was delivered (but they kindly offered to sell us more). If Martin understood his business, he would have understood that we wanted the reclaimed look of the sample and sanding it all off was not a good suggestion. If he understood customer service, he would have offered to replace the pieces we don’t like with some that we do like. He claimed they have a warehouse in Oregon with plenty of the wood, it wouldn’t be difficult to go pick out some pieces that look closer to the sample and ship them to us. They kept telling us that this is a small order, so it wouldn’t take much wood to replace the 30% or so of the wood. He could have even suggested that we split the cost of the new wood with them for a win-win resolution: they get some profit, we don’t have to go look for a new source again and they have a happy contractor and interior designer that is likely to recommend them to future clients. Instead, Martin refused to budge, blaming the problem on his customer and our contractor and trying his best to make everyone unhappy. This is a company that doesn’t stand behind it’s product, doesn’t understand or even care about what their customers want and then asks for and expects more money. They sound and act like a fly-by-night company. Several years ago I interviewed with this company. It was a giant waste of my time. I found Mr. Brett very unprofessional and arrogant in demeanor. I saw the signs, however, I foolishly travelled to meet with them. I did not get the job, I assume, because they never got back to me after paying to bring me to their HQ and several phone interviews (all of which he was late to call). I would not buy a thing from this company.